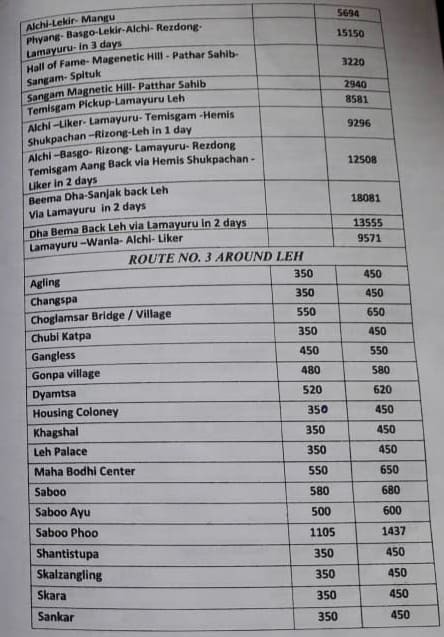 Looking for Leh – Ladakh Taxi Rates 2019 - 2020? 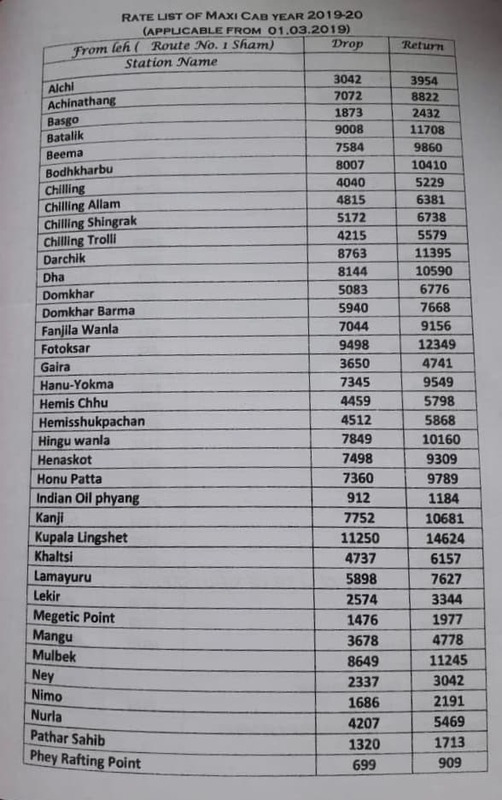 The new season for Leh – Ladakh travel is about to begin in 2019 and as expected by this time of the year, Ladakh taxi union has published the Leh – Ladakh Taxi Rates 2019 – 20. 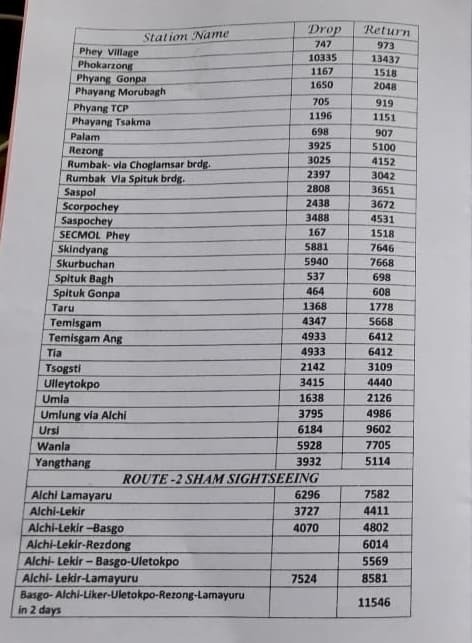 In this article today, I am going to share with you the latest taxi rates of the year 2019 – 20 for all the routes in Leh – Ladakh. Tourism in Leh Ladakh is on the rise year after year. Thousands of tourists who visit Ladakh every year opt for local taxis in Leh instead of driving their own cars. A lot of them travel to Ladakh by road from Manali and Srinagar. However, cost of taxis in Ladakh has always been a topic of debate among the tourists, travelers and the locals of Leh Ladakh. 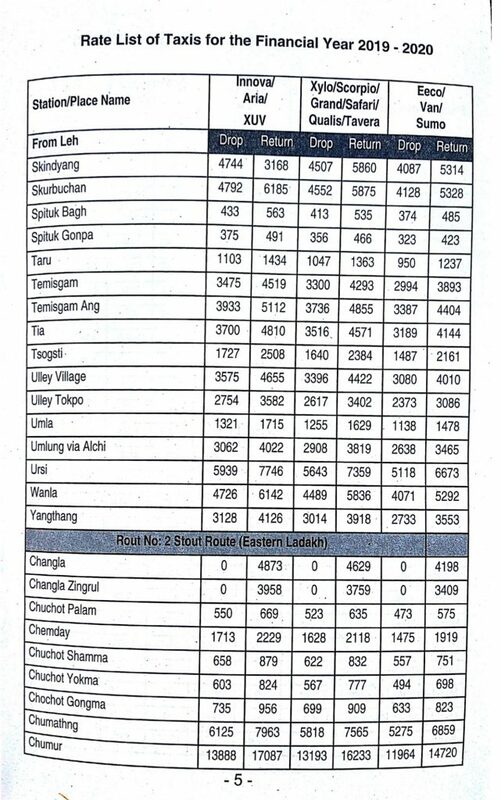 Let us look at how deep a hole these Leh taxis rates will put in your pocket when you plan a road trip to Ladakh in 2019 – 20. 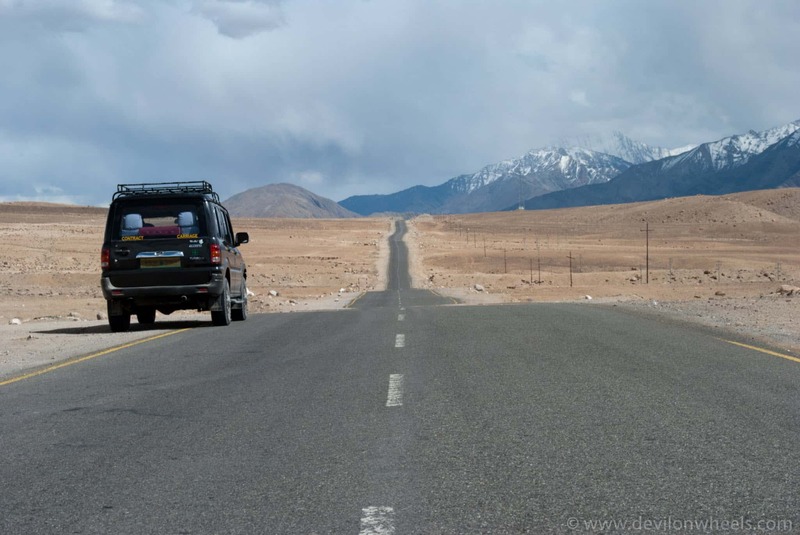 Where to get self-drive car in Leh – Ladakh? Can I take a self-drive car to Ladakh? 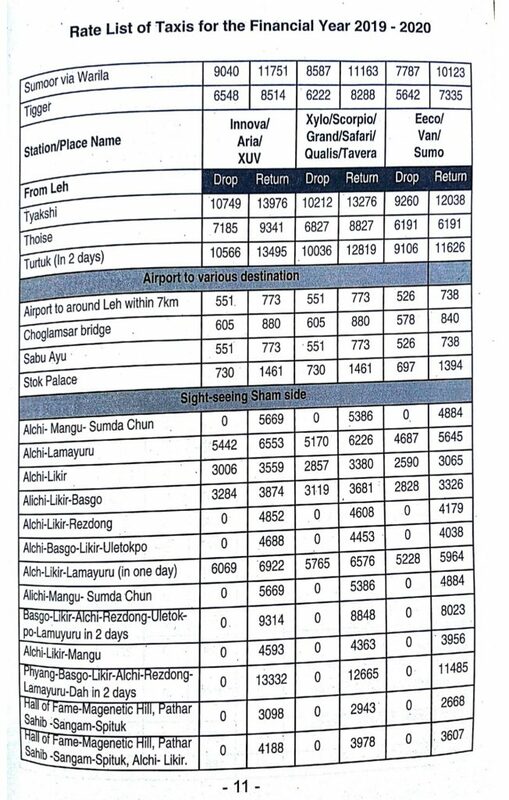 Are taxis rented outside Leh – Ladakh allowed? Are there any affordable taxis in Leh – Ladakh for solo travelers or couples? 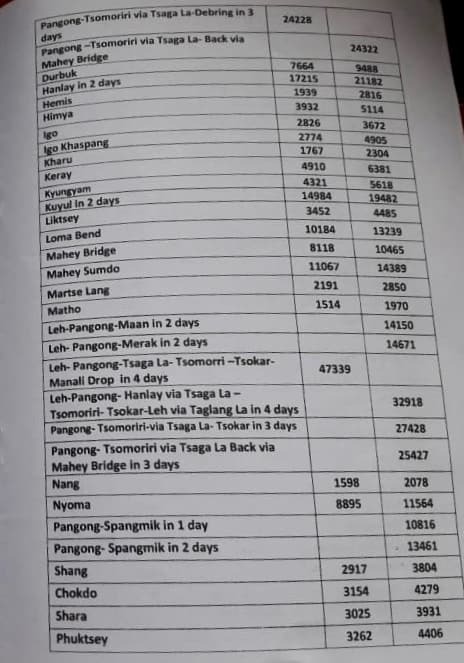 In accordance with the last 2-3 years of marginal increment in Ladakh taxi union rates, there has been a steady 8 – 10% increase in the Leh taxi rates for the year 2019 – 20. Inner routes in Ladakh have seen a steady hike including traveling to Nubra Valley, Pangong Tso and Tso Moriri. 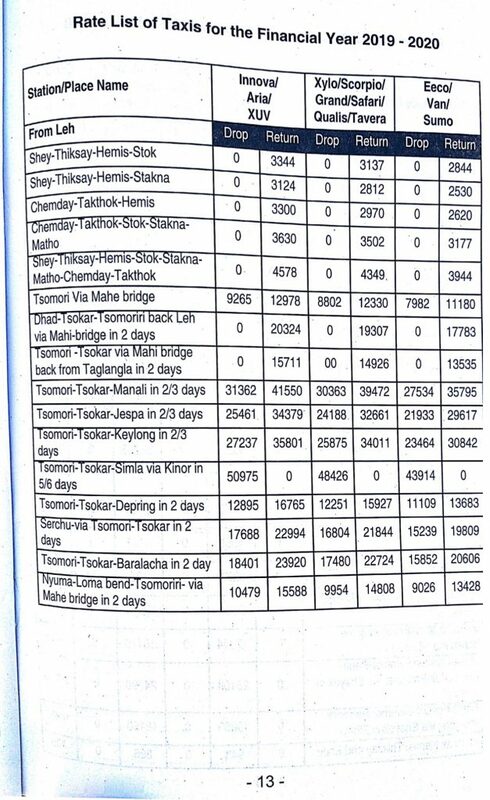 On the similar ground, the long routes of Leh Manali Highway and Srinagar Leh Highway have seen an increment of almost 10-12%. 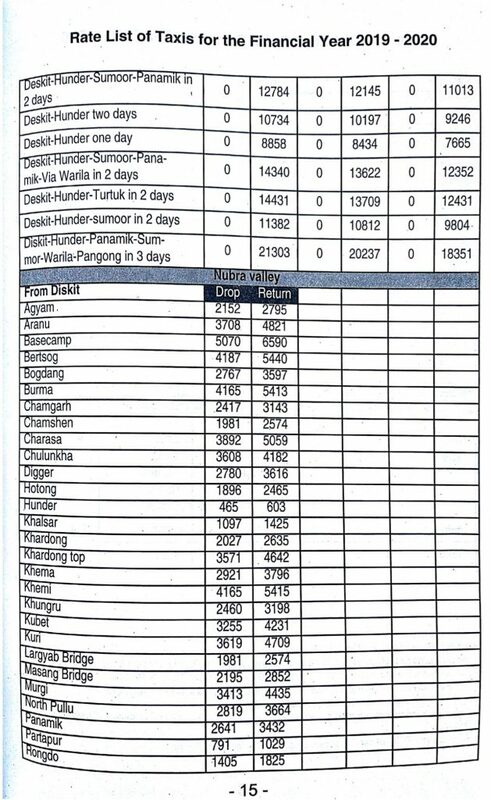 This means that the trip to Leh Ladakh will cost you only a little more when you travel by taxis as compared to last year. 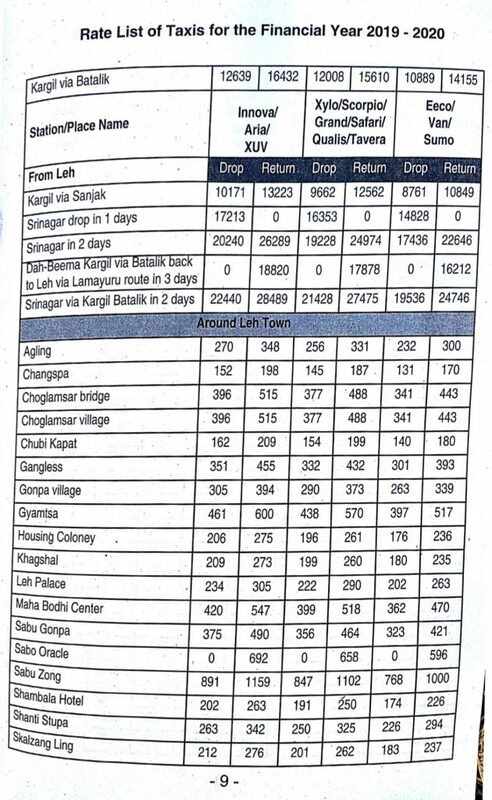 However, given the terrain, I expect it to increase by 8-10% every year and Ladakh union has done a great job in maintaining it in last few years. 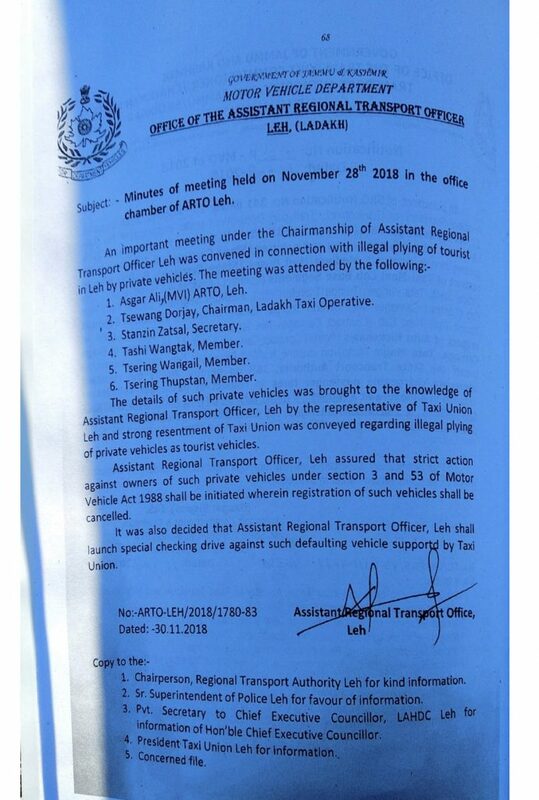 I believe it was very well expected from Leh – Ladakh taxi union and it will be interesting to see how the tourists approach the road trip to Ladakh in 2019. People going first time to Leh – Ladakh must say or feel that rates of the Ladakh taxis are very high. With this increment in prices, some of them will be feel it more even. However, there are always good reasons to choose a local taxi in Leh – Ladakh over an outside state taxi or drive, which anyways are not allowed for sightseeing within Ladakh. 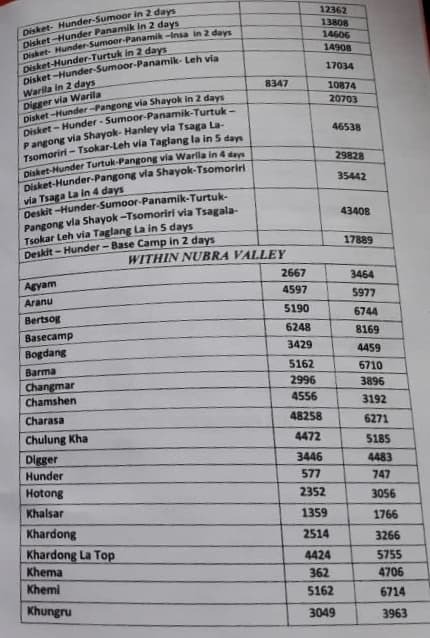 Please note that at times while going from Srinagar to Leh, you might need to work out few things if there have been some tensions in taxi unions of Kargil and Leh. 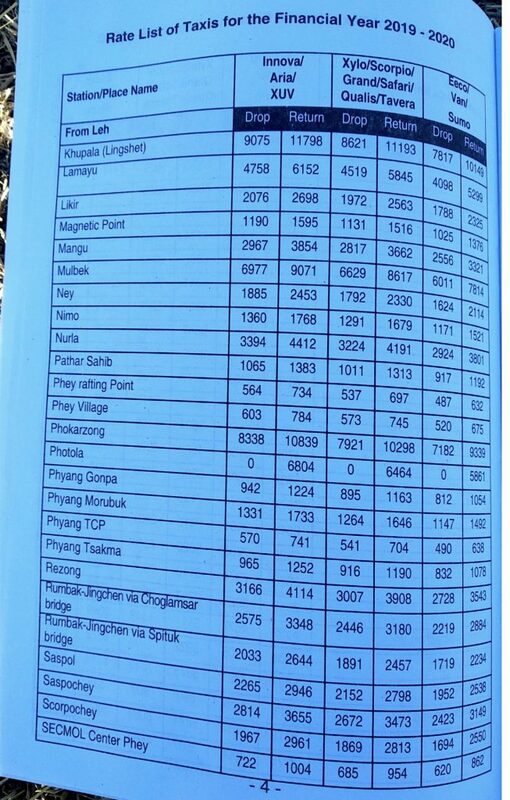 In order to settle it out, what they do is that they make a transit point just before Fotu La while going to Leh from Kargil. 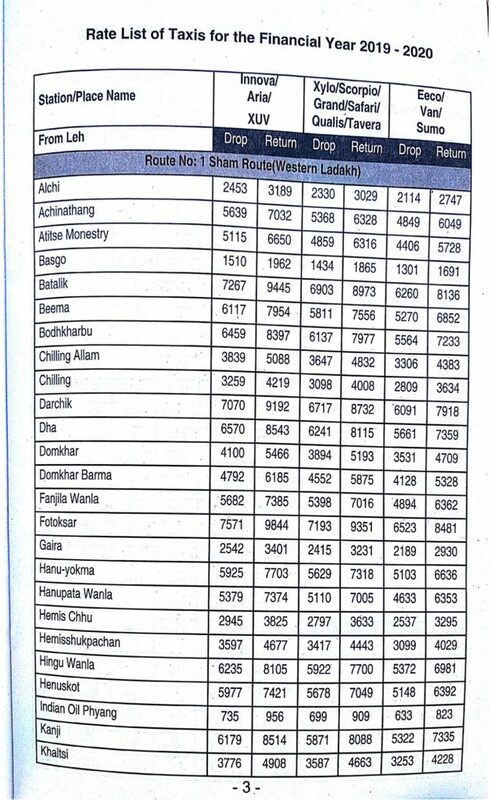 All Leh taxis stop there and Kargil taxis too. They exchange passengers and move back in respective directions. 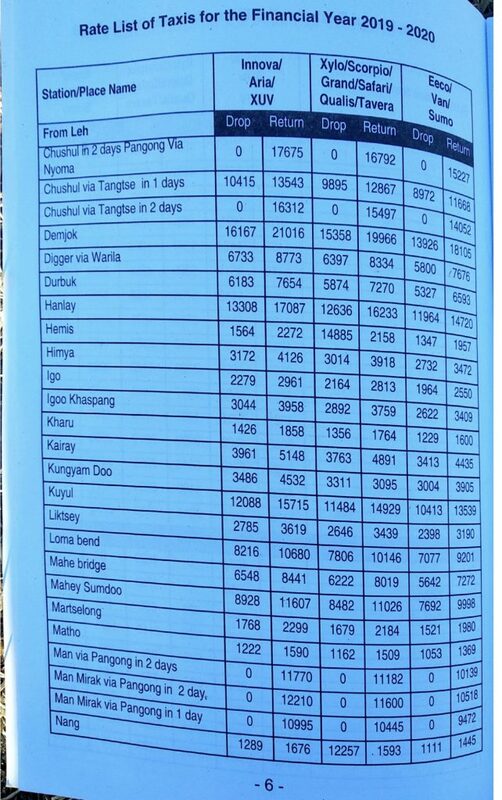 Leh taxis take passengers to Leh coming from Srinagar/Kargil and Kargil guys take passengers to Srinagar/Kargil coming from Leh. But, that happens only when there is an issue. 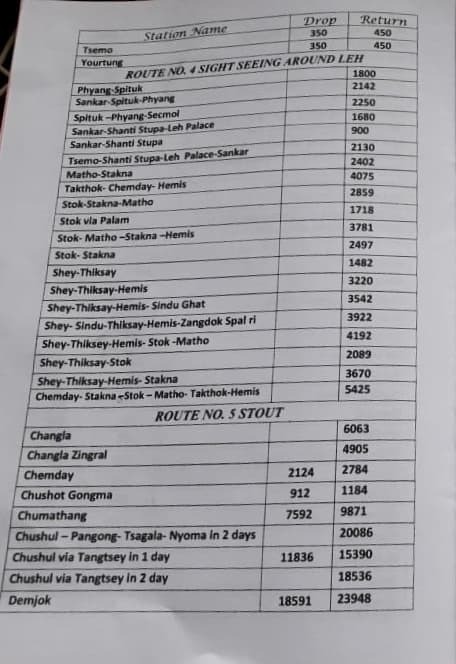 The Leh – Ladakh taxi rates list below covers Ladakh sightseeing including trips to Nubra Valley, Pangong Tso, and Tso Moriri. 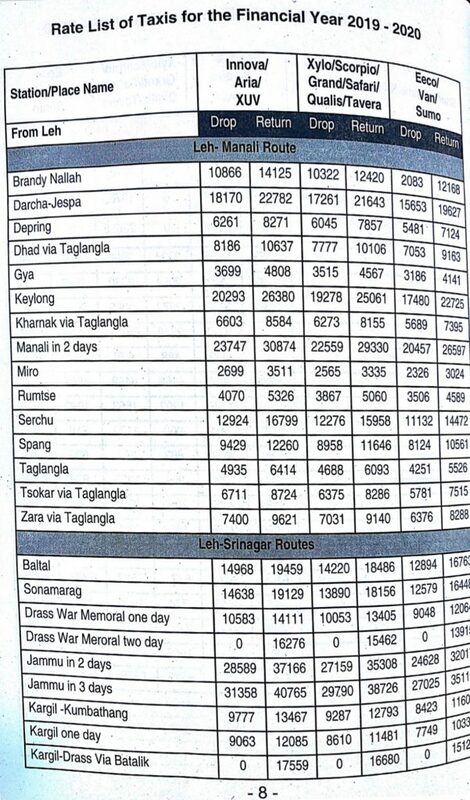 It also covers the taxi rates for Manali – Leh Highway and Srinagar – Leh Highway routes. 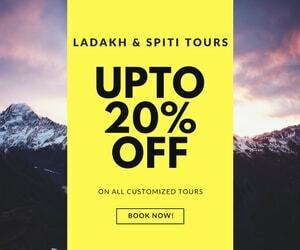 I am also enlisting below some of the most frequently visited trips in Ladakh and the applicable taxi rates for those routes. This will help you quickly get a rough idea of your budget for a taxi in Leh – Ladakh. 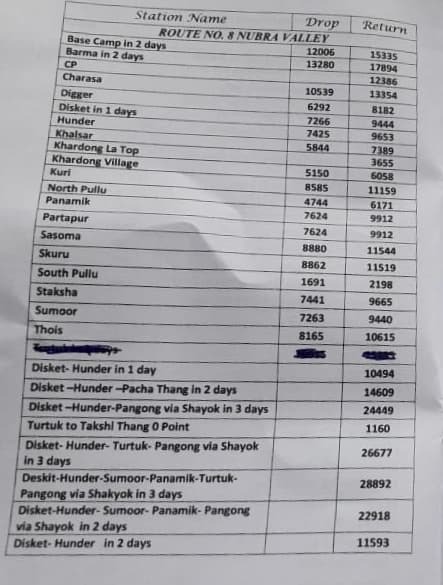 I am sharing below the images of Leh taxi rates 2019 shared with me by our driver friends from Ladakh. Some of these reliable taxi drivers are also listed below in this article. 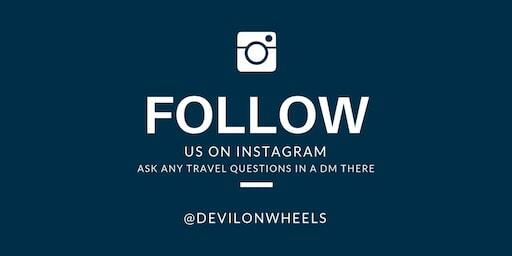 I am thankful to them for their good services to the tourists and glad to understand that Devil On Wheels travel platform has made a real difference in the lives of the local people of Ladakh in the Himalayas. 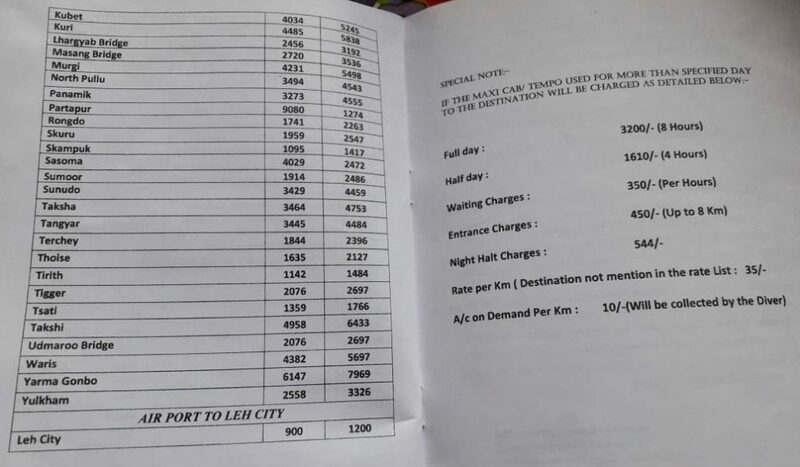 Here is the rate card for Leh Ladakh taxis in 2019 – 2020 season. You should note that using white number plate cars as taxis or private cars as taxis in Ladakh is not allowed by ARTO Leh. Such vehicles might be checked and hence, it is important that you avoid renting such cars for taxi purposes in Leh. You can take your own private car with you for sightseeing in Ladakh. Such private vehicles are not banned and do not have any issues. Sonam Angdus – 09469272773: More like Rigzin and Chamba, Sonam ji has been associated with Devil On Wheels for a long time and have been to all our mega meets alongside Rigzin. He knows me and DoW very well and always happy to support all the members of Devil On wheels by any means he can. He is ex-serviceman, one of the best persons you will come across in Ladakh and his company will keep you soothing & safe. Never gets frustrated with many stops, always smiling and helpful. He runs a Xylo and is a very very safe companion. In case you get his availability, don’t feel hesitant to book him for the tour. Karma Sonam – 09419215110 & 09906991011: His email id is [email protected] He speaks in English and Hindi nicely. Detailed Reviews in the forum thread. Rigzin Stakna – 09622951113 & 09419349082: Excellent human being with a great sense of humor and comic timing along with great driving skills. He is an excellent human being, very down to earth and very lively! He is a very good driver and knows in/out of every route. He is very punctual, he will arrive 10-15 minutes before the agreed time. Detailed Reviews in the forum thread. Rinchen – 09419819521 & 09622954831: Rinchen is a hassle-free driver and has a friendly demeanor. He knows a lot about Leh’s culture and keeps you engaged as well. Detailed Reviews in the forum thread. Sonam – 09419347945: As per reader feedback “Also he has a guest house ready at the Gompa village–named ‘Apna Ghar’.I am sure that would turn out to be one of the great places to stay in Ladakh, away from the market’s hustle bustle. Please find the details below. This guy definitely needs recommendation at your site. That’s the minimum I could do for the hospitality he and his family showered. He can provide stay as well as a taxi for the tours in Ladakh. He Owns a black Innova. 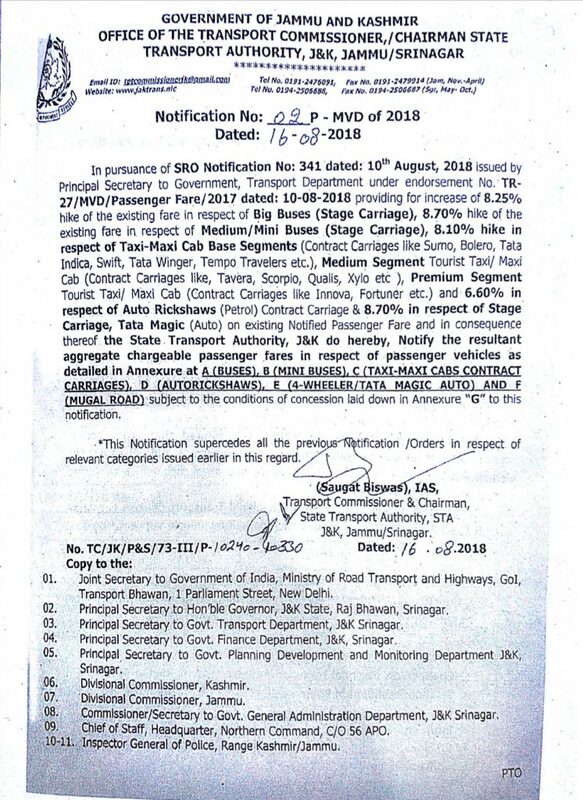 Unfortunately, you can only use the self-drive rented cars with black number plate and yellow number plate, just to enter Leh and exit Leh from Srinagar – Leh Highway or Manali – Leh Highway. However, you cannot use them for any kind of sightseeing within Leh – Ladakh to places like Nubra Valley, Tso Moriri, and Pangong Tso. For sightseeing within Ladakh, you will need to hire a Ladakh based taxi. Self-drive rented cars and taxis outside Ladakh are not allowed to do any sightseeing within Leh – Ladakh. 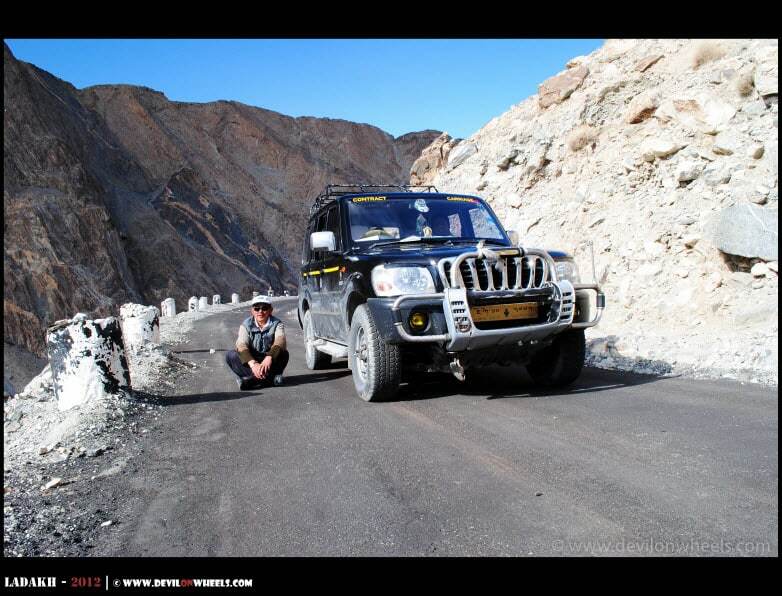 You can use them for getting to Leh and getting out from Leh but not for any kind of sightseeing within Leh – Ladakh. You are alone/couple and private taxis are very costly in Leh but you will be able to find the shared taxi without much fuss at all. 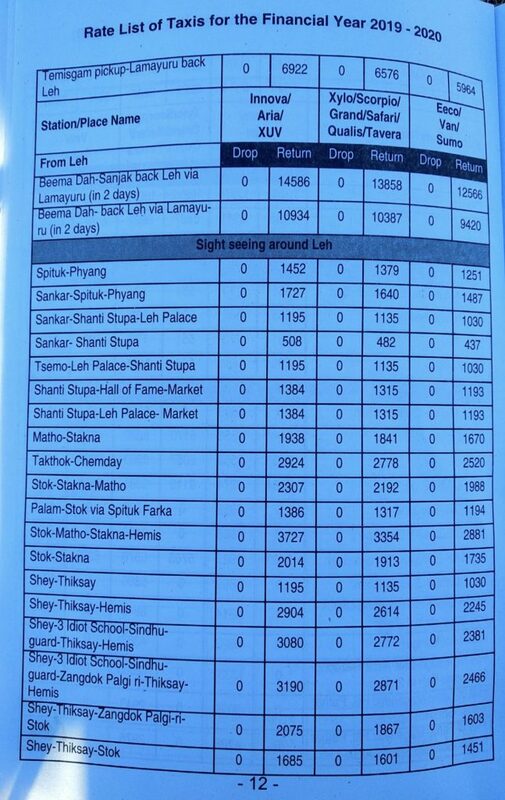 There are lots of flyers which people put at cafes, dine-ins, restaurants, travel agent desks/shops/whiteboards wanting to share the taxis for different trips within Ladakh. It will be much better than you check the DoW Travel Calendar from the link in the Main Menu of the website. There had been about 800+ entries of the people planning their trips in the last few seasons which helped them have better visibility for finding out travel partners online. You can filter entries based on the preferences you have and increase chances of visibility. 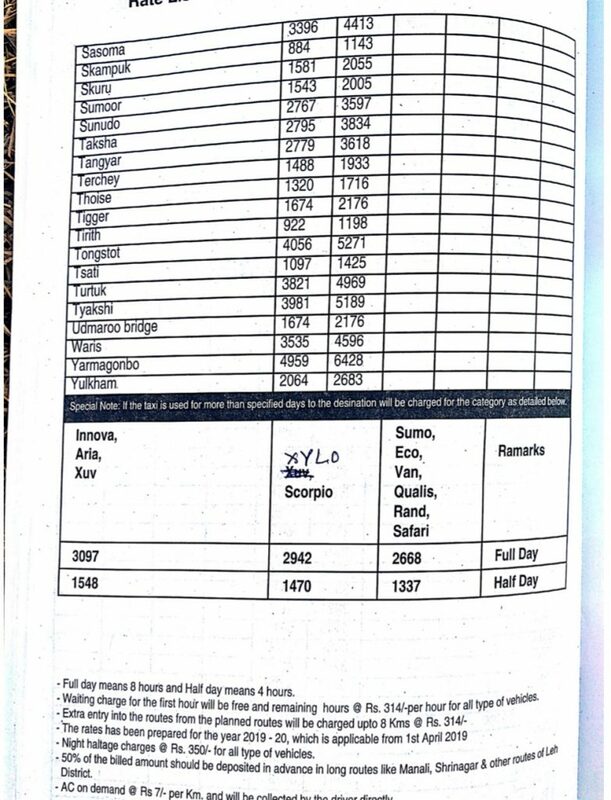 Hence, kindly explore DoW Travel Calendar and also post your entry too. This will help you find other fellow travelers looking for company and increase the probability of finding your post by others too. You can also post a DoW Travel Calendar entry by using the Main Menu and clicking on Submit New Event option in it. 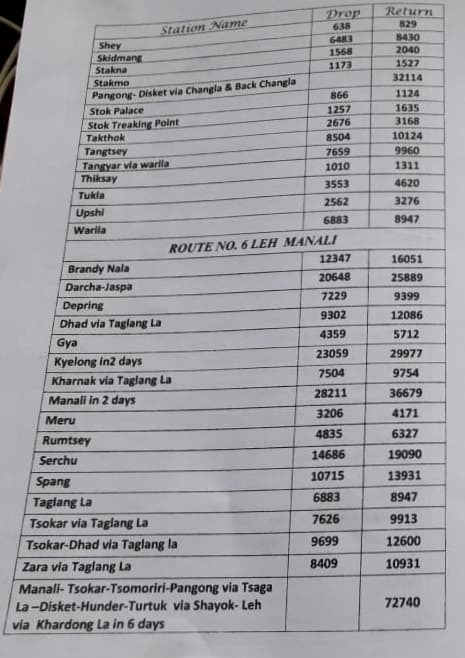 I understand that the costs of a taxi in Leh – Ladakh is pretty high but considering the region, wear and tear, maintenance, the difficulty in driving and a short tourist season, you start feeling them justified. 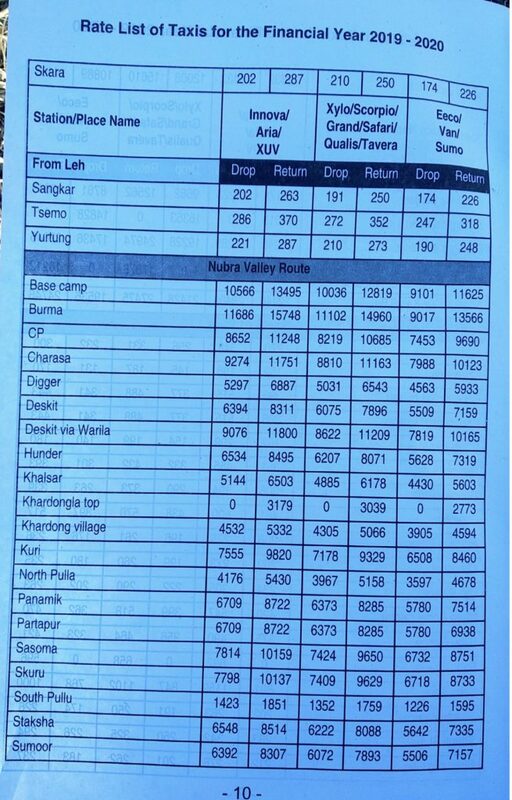 Always remember that you can count on most of these drivers to get you good accommodation in Ladakh too even in case you have not booked it. Most of them are not those kinds of commission agents that will take you to the hotel of their own interest only. So, you can mostly count on them for stay options too in case you have not done the pre-bookings. They can genuinely help you as well as locals of the region who may provide you authentic Ladakhi stays. 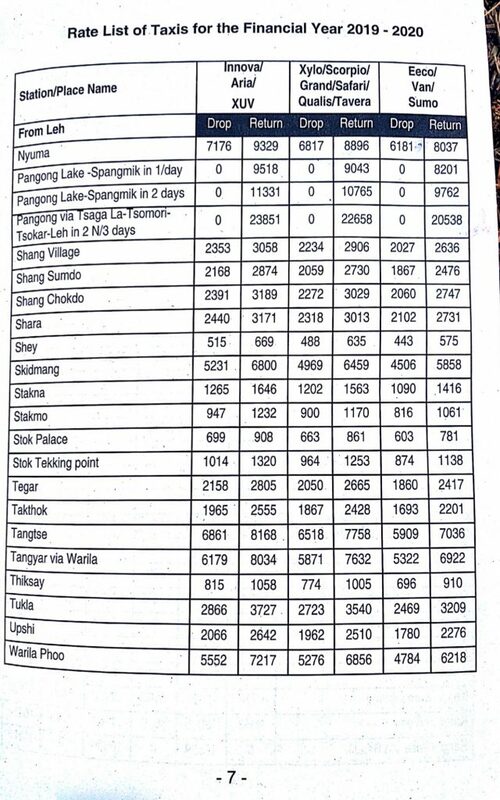 I hope the above information will be useful for your upcoming trip to Leh – Ladakh. In the end, if you have been to Leh – Ladakh before, kindly share your thoughts and self-drive information you might feel is worth sharing with other fellow travelers and help them. Hi, we are a couple from Guwahati. We are planning to hire an Innova/SUV. Please contact if it happens to matches your itinerary. Can be made a bit flexible. Below is our itinerary. Jun 19 – Leh – Diskit. – Hunder. Stay at Hunder. Jun 21 – To Pangong via Shyok or Wari la. Stay at Pangong . Jun 24 – Towards Sarchu. Via Tso Kar. Stay at Sarchu. 1. 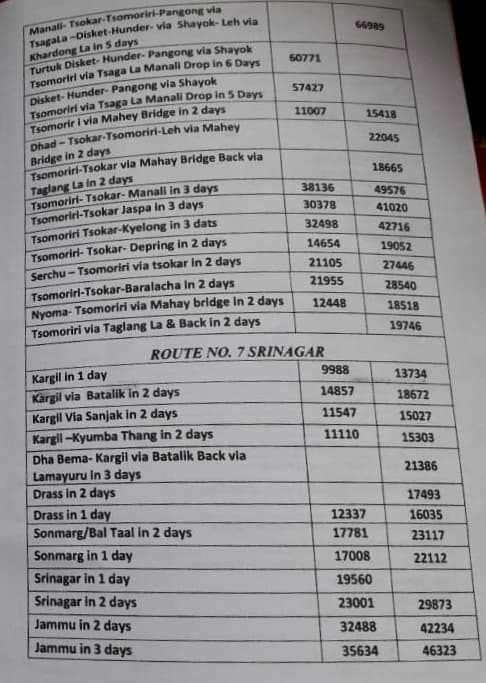 Can i get a shared taxi from Srinagar to Leh and back. What are the timings of these taxis and the price. 2. Can you suggest me a local travel operator/ Taxi driver who can accommodate me in a group bike or SUV tour including all stays and sightseeing. My family is also of 3 persons . my cell no 8999982017 . We are family of 3 members reaching Leh on 21nd June. we shall be happy to share SUV with a like-minded couple OR a family of 3. Our itinerary can be changed to a certain extent to accommodate the fellow travellers & to economise the tour. please advise. Im planning to travel to Leh with 4 other friends, by hiring self driving car through Delhi-Srinagar-Leh-Manali-Delhi. 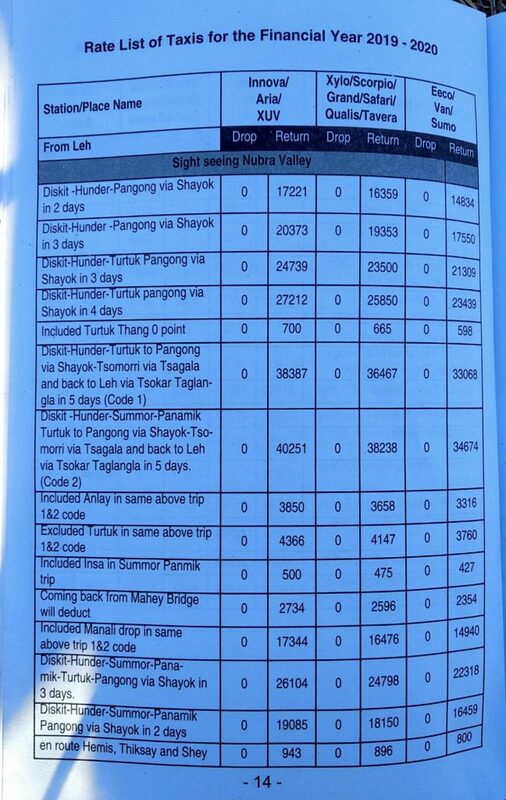 Since you mentioned private cars not allowed for local sightseeing at Leh, is it still possible that we reach Leh to our hotel and park the car there, while doing the sightseeing through local taxis? Very much thankful for your article. My query is,shall I get one vehicle for my complete tour in Ladakh region? If yes,then what are the costs for it?